Morganfield’s Top Value Set Lunch from only RM12.90 nett. 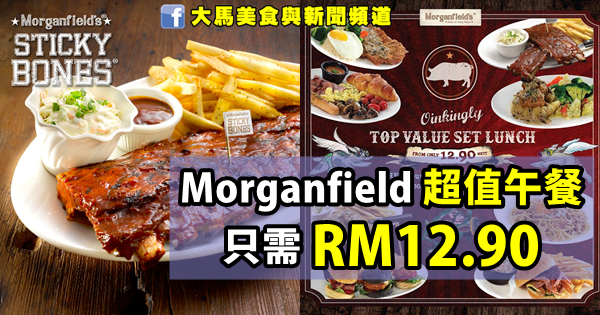 Morganfield’s Malaysia is having promotion. Enjoy the top value set lunch from only RM12.90 nett + FREE Soup of the day / House sale and bottomless soft drink. This promotion is valid on weekdays only, from 11am – 4pm at ALL Morganfield’s outlets in Malaysia, except Morganfield’s SkyAvenue, Genting Highlands. On top of that, you can also enjoy Buy 6 FREE 1 set lunch. Terms and conditions apply.